ZyCast® Technology, Inc., an award winning design and engineering company of AV over IP distribution solutions, has partnered with Zixi®, a pioneer in the delivery of video over un-managed networks, to develop a full range of Zixi Edge Solutions to its customers. The newly released ZyCast HDZ-800 HD feeder encoder is the first announcement for the promising partnership. The HDZ-800 accepts input from professional-grade cameras and other sources and is embedded with Zixi’s proven error-free feeder protocol. This makes for streamline communication with Zixi’s Broadcaster and Zixi embedded receivers allowing high quality HD video over standard Broadband Internet connections between two sites or multiple point-to-point connections. What this means for the industry is that dealers will easily be able to integrate the HDZ-800 into HD video streaming over standard Broadband connections at a very competitive price. The HDZ-800 is ideal for live-streaming content such as concerts, house of worship sermons, professional and collegiate sporting events, commencement ceremonies, and other live events. 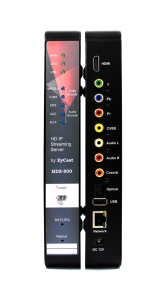 The HDZ-800 expands Zycast’s IP streaming encoder offerings to nearly 20 encoders. While this is impressive, ZyCast continues to innovate. Many of their state-of-the-art products will be on display at the National Association of Broadcasters (NAB) Convention in April. The client and end user remain a driving force for ZyCast product development. Chang concluded, “This year will be an exciting one for ZyCast and our customers as we release additional Converter and IP products to the market. We will continue to listen to our customers and provide them with the solutions they need to satisfy their client’s real-life demands.” For more information about ZyCast and the Zixi Feeder encoder, visit ZyCastTech.com.